From left, GlobalFoundries executives Janette Bombardier, Mike Cadigan and Brian Harrison speak at a press conference at their Essex plant. GlobalFoundries announced Wednesday that it completed its acquisition of IBM's chipmaking division. That includes the Essex plant, which GlobalFoundries has pledged to keep running. The two companies announced last October that IBM would pay GlobalFoundries $1.5 billion to take over its money-losing chip unit, which includes the plant in Essex. But the deal had to clear hurdles first. Because GlobalFoundries is owned by the Emirate of Abu Dhabi, it needed to obtain clearance from the Committee on Foreign Investment in the United States, an interagency panel charged with reviewing major business deals to safeguard national security. The companies announced Monday that the committee had approved the deal. 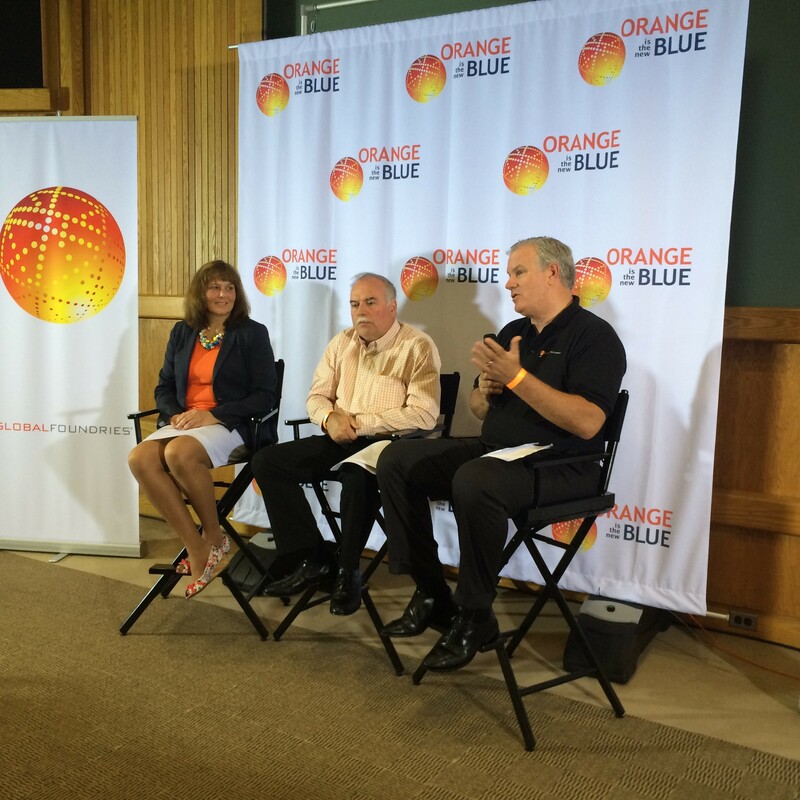 Under banners that read “Orange is the New Blue,” GlobalFoundries executives Wednesday held a press conference at the Essex plant and pledged to keep all employees. They said they will likely invest in the facility, which has been one of Vermont's economic engines for decades. The employees who worked at the plant before the takeover were allowed to keep their jobs, pay and benefits package they had with IBM, said Janette Bombardier, Global Foundries’ Vermont senior location executive. “We refer to it as no one left behind,” said Mike Cadigan, head of GlobalFoundries Product Management Group. Additionally, hundreds of IBM employees who work in Essex for other divisions of Big Blue that were not part of the takeover will remain at the plant, Bombardier said. IBM will now be a tenant at the plant. GlobalFoundries is looking to fill several open manufacturing positions at the plant, Bombardier said. The executives also pledged that the plant’s charitable and community initiatives will not change. Executives said the Essex plant is a natural fit for GlobalFoundries. Its Essex employees will now work for a company devoted entirely to the semiconductor chip business. GlobalFoundries acquired 16,000 patents and patent applications in the deal, giving it one of the world's largest patent portfolios. “It was evident that the talent and skills that were part of the microelectronics [unit] became extremely critical to … GlobalFoundries,” Cadigan said. The Essex plant will complement GlobalFoundries’ facilities in Malta, N.Y., where the company has invested $10 billion, and in East Fish Kill, N.Y., officials said. Executives said the New York plants have different equipment and missions, and would not be able to take on work that is done in Vermont. GlobalFoundries also operates plants in Germany and Singapore. As part of the deal, IBM has agreed to use GlobalFoundries as its chip supplier for the next 10 years. The Essex plant employed 8,500 people at its peak in 2001. Before the deal was announced last year, fear spread about the future of the 4,000-plus jobs that remained at the facility. A Greater Burlington Industrial Corporation report suggested that 10,000 Vermont families were supported directly or indirectly by the plant.